My first bout as a Whippin Hinny was in sunny Grimsby, Lincolnshire (no really! 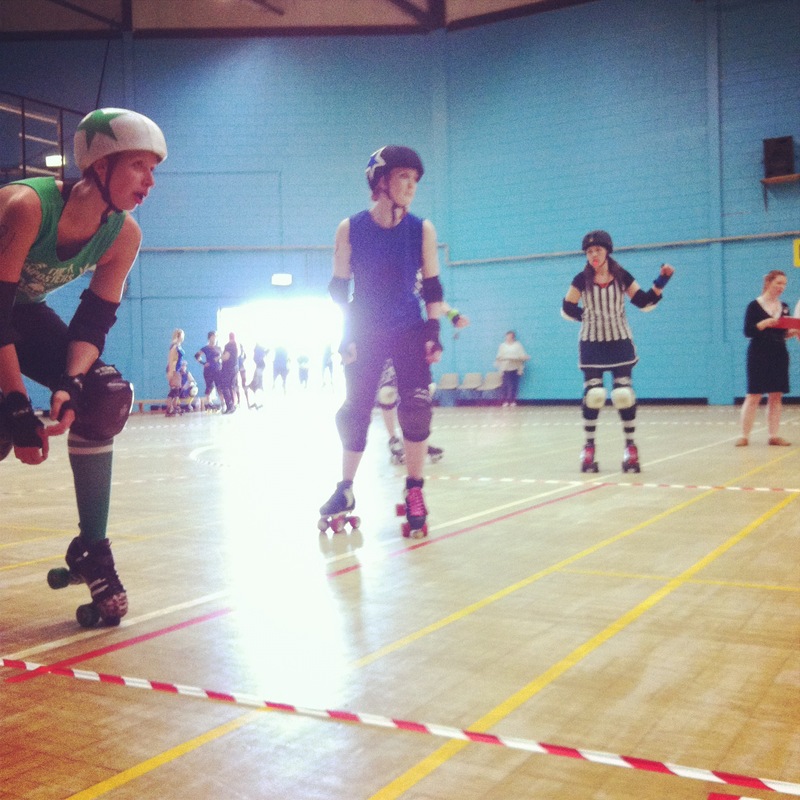 ), where we faced off against The Imposter Roller Girls. I’m no stranger to the Imposters, having seen them lose to Middlesbrough Milk Rollers when I played their opening bout, but still felt ridiculously intimidated when I rolled up to Grimsby Leisure Centre. The Imposters were welcoming, though, and didn’t mind us leaving our belongings strewn across their changing room floor. After a lot of “does anybody have any tape?” and “do I have time for another wee?” and “I used all the tape, does anybody have any left?” it was time for our skate out to of Ball of Mayhem’s blistering tune Obliteration Imminent. But it was the Imposters who had the skate out to talk about, peeling away from their bench to Let’s Get Ready to Rumble by PJ & Duncan – the song used by NRG’s Canny Belters. 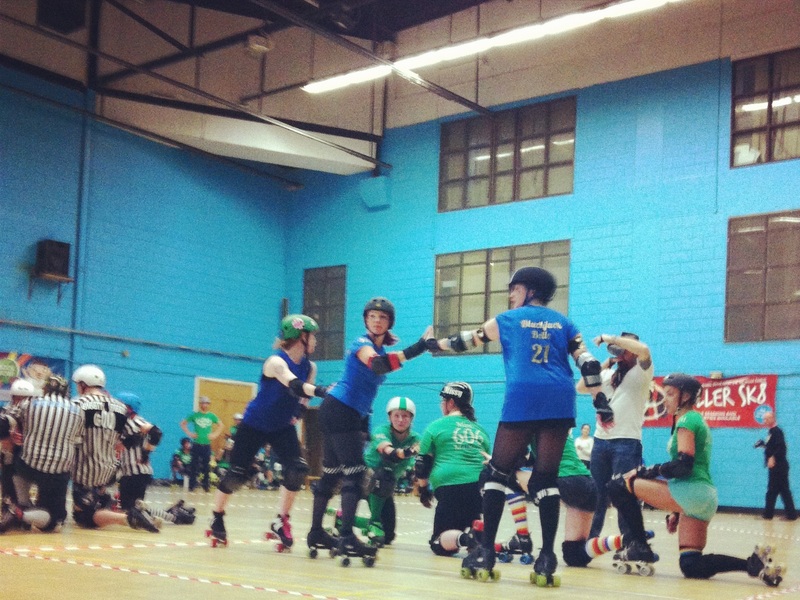 After a kit check and a boogie woo – wherein Levine Dead fell over whilst shaking her arse – the bout began. Not being in the first jam is probably the best thing I can hope for at a bout, because it takes a while for my nerves to become nervous energy. When I saw the Imposters make a dash for the pivot line I panicked. We all did – unsure of how to counter attack. We did out best but our walls let us down, the Imposters smashing through them with ease. 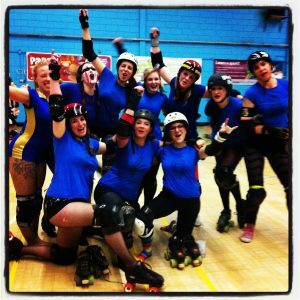 We tried to reform as quickly as possible whilst helping our jammer out of their relentless pack but it felt as if they had double the amount of players – they never let up. When it came time to swap benches at half time their head NSO approached us and said, “The score board only goes up to one hundred and ninety nine and then it resets, so if it goes back down to zero it’s only because it can’t go up to two hundred,” and we all decided that it was never going to go back down to zero because their winning was going to stop. Full stop. 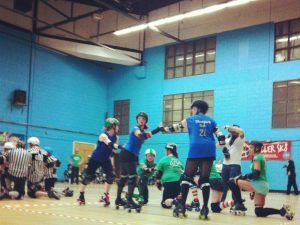 Somewhere between NC Hammer and the opposing jammer flying off track and wiping out half of the crowd and one of the Imposters jamming her head between two Hinnies in a wall I took a seat in the penalty box for a team mate who had been fouled out. I’ve never had to do this before, and panicked so much I didn’t listen to the penalty timer when she told me to stand and then I tried to catch up the pack – I’m five foot short, I can only skate so fast – and didn’t make it to the back before the jam ended. With a final score of 259 to the Imposters and 69 to the Whippin Hinnies we ‘came second’ by a clear margin, but that didn’t dampen our spirits. 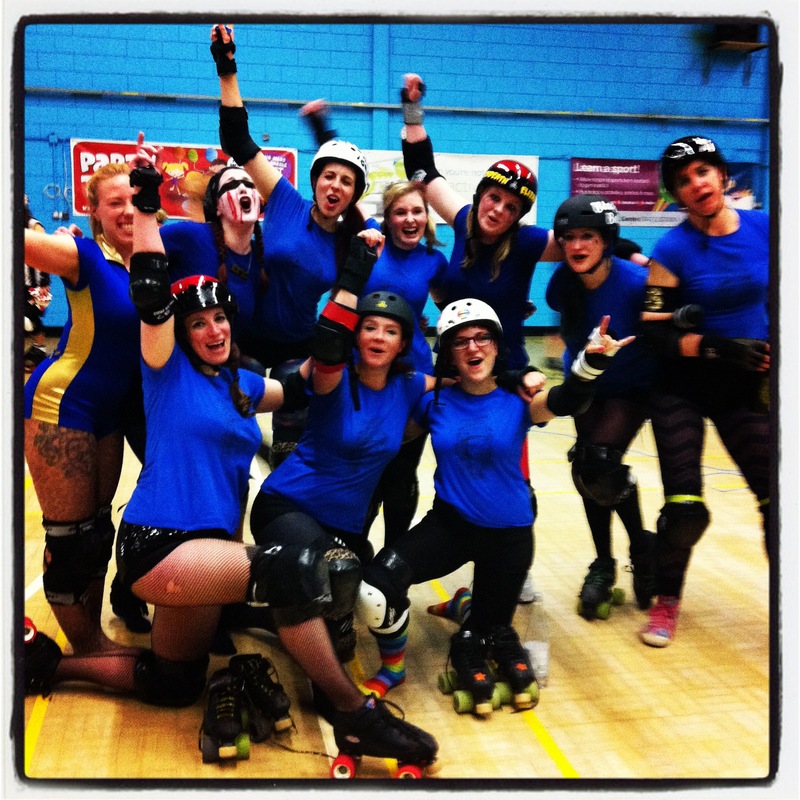 We played to win and it was a challenge, but we still had on our happy (and pretty sweaty) faces despite it all, and we know as a team what we need to work on for our home bout against Kent Roller Girlson July 14th. And as PJ and Duncan said, let’s get ready to rumble!